(L-R) are Nick Manafort, Jesse Garuti and Jason Manafort of Manafort Brothers, Staff Sargent Anders and Corporal Hess of 225 Fox Company Marine Corps Reserve of Plainville, Jon Manafort of Manafort Brothers, Past Commandant John J. Lynch, Detachment Commandant James Morris and Past Commandant Fred McGoldrick of the Marine Corps League-Hardware City Detachment 781 of New Britain, and Jon Manafort. 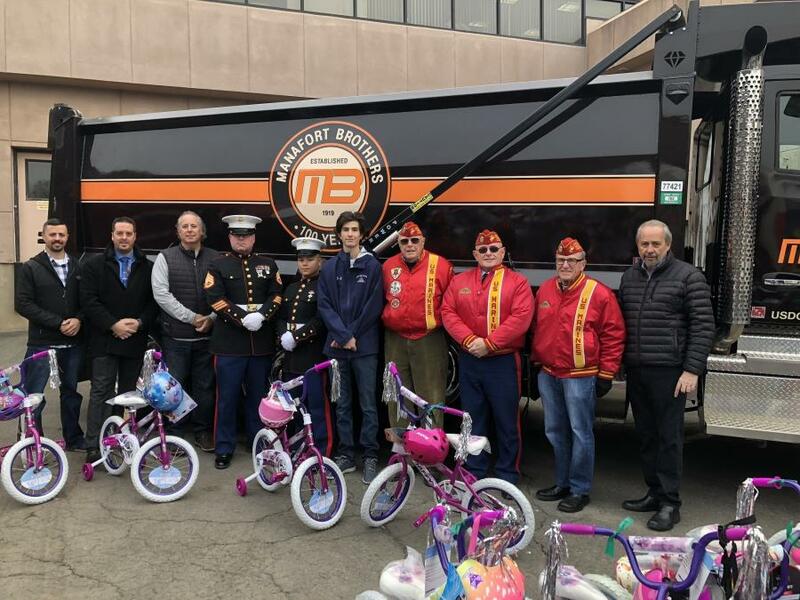 The entire staff of Manafort Brothers Inc. brightened the holidays for local children in need by donating 100 new bicycles to the U.S. Marines Toys for Tots program to commemorate the company's 100th anniversary. The Marines picked up all of the bikes at the company headquarters in Plainville, Conn., on Dec. 13 and will start distributing them to area towns. The tradition was started by Jake Vandrilla, a former head mechanic and U.S. Marine, who worked at Manafort Brothers for more than 40 years. Although Vandrilla passed away a few years ago, the company honors his legacy by continuing the popular charitable drive. "Each year since 1997 our employees have generously contributed to our companywide Toys for Tots collection and in 2007, we began dedicating the drive to purchasing new bikes," said Jim Manafort Jr., president of Manafort Brothers Inc. "This year, our various generous affiliates, vendors, family and friends helped us reach our collection goal by donating 50 bikes." Contributing companies that helped make this season's bike donation so successful include: New England Industrial, Big Sky Fitness, US Ecology, SilPro, Pro-Teck LLC, The Bar on Cedar, Engineered Product Sales, Independent Pipe, Mike Alessandra Masonry, Manafort Precision, D. Brescia Construction, Red Technologies LLC, CWPM, Public Market of Newington and Milwaukee Tool. "We can only envision this powerful program growing in size and scope and we all look forward to continuing to support the cause in the continuing years." Manafort noted that the construction company has always been committed to giving back to many local charitable organizations. The company regularly contributes to an extensive list of civic, children's and health groups, such as Wheeler Clinic, the VFW, Boys and Girls Club of New Britain, Boy Scouts Pack 49, Berlin Police Association, New Britain PAL and Plainville Police Union Local #1706, as well as several sports teams and leagues, including Berlin High School Hall of Fame, Plainville High School Backers, Plainville Little League, and the Plainville Colts, among many others. Founded in 1919, Manafort Brothers Incorporated is a recognized leader in the construction and demolition services industry. Headquartered in Plainville, Conn., the 4th generation, family-owned company has regional offices in Worcester, Mass., and Cumberland, R.I.
For more information, call 860/229-4853 or visit www.manafort.com.